The best method of boosting fertility while breastfeeding is charting – basal body temperature, cervical mucus and periods, if applicable. 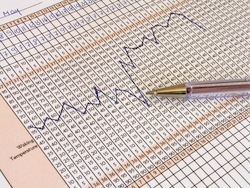 Charting gives you a chance to rediscover how your body is naturally cycling each month now that baby’s been born. It also will help you identify if and when you start ovulating again. Ovulation is necessary for getting pregnant. Some women notice subtle changes in postpartum cycles and others notice dramatic changes making it extremely difficult to know exactly when you’re most fertile. Charting may not help you get pregnant again right away, but it helps you find out about your fertility, when and if you ovulate, and it will allow you to recognize changes in your body as your fertility returns.